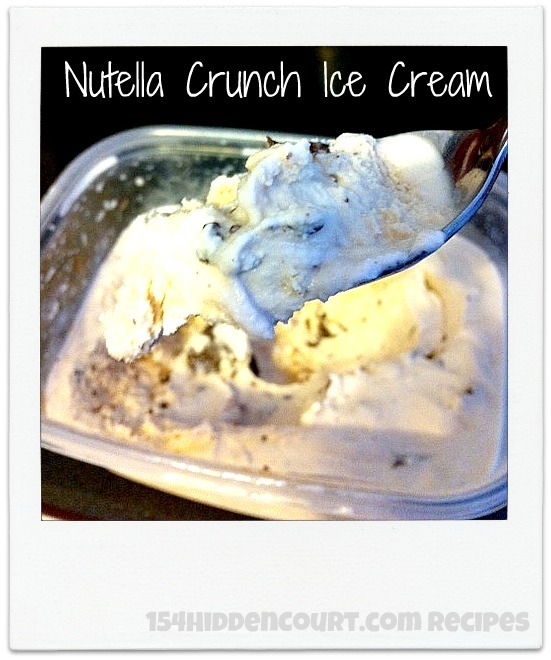 154 Hidden Court: Nutella Crunch Ice Cream. Oh. My. Word. Nutella Crunch Ice Cream. Oh. My. Word. I came on board the Nutella crazy ship pretty late in the game. It's delightful and all, but I struggle about what to DO with it. Sometimes I dip fruit or marshmallows or pretzels in it, and that's good, oh so good, but my creations beyond that have been few and mainly unsuccessful. Then the other day I was staring my ice cream freezer down in an attempt to come up with some sort of wondrous recipe that would make the sun shine, the birds sing and the kids shout from the rooftops "YOU'RE THE BEST MAMA EVER!" when it occurred to me. Nutella plus ice cream equals a little bit of cold Heaven in a cup. afternoon light streaming in before I take a picture of it. Freeze your ice cream freezer bowl according to manufacturer's directions. In a microwave safe bowl, heat 1/2 cup Nutella and the cream or half and half 30 seconds at a time, stirring frequently, until the Nutella is melted and incorporated into the cream. Allow this to cool completely. Add the cream/Nutella mixture, the sweetened condensed milk and the almond extract to your ice cream freezer according to manufacturer's instructions, and allow to freeze. During the last 5 minutes of the freezing cycle, drop the remaining 1/4 cup of Nutella in 1/2 tsp. at a time, then add the nuts. The Nutella that goes in at the end of the cycle will not be fully incorporated into the ice cream. Instead, it will freeze and break up into delightful soft chunks of Nutella, like little nuggets of delight in your mouth. The boys and I ate most of it straight out of the ice cream maker, but you can also put it in your freezer for later, if that's how you roll. Ensign India - We manufacture, trade and retail various kinds of Commercial Kitchen Equipments including Display Cabinets, Freezers/ Chillers, Coolers, Fast Food Counters, Exhaust & Fresh Air System, Kitchen Equipment Manufacturer, Sandwich Griller etc. Ensign Equipments offer a wide range of products, which includes Preparation Area, Preparation Table, Preparation Table with Sink, Stock Pot Stove, Two Burner Gas Cooking Range, Three Burner Gas Cooking Range, Four Burner Range with Oven, Electrical Range with 4 Hot Plate, Chinese Cooking Range, Tea Boiler, Milk Boiler, Tea-Milk Dispenser, Toaster, Espresso Coffee Machine, Juicer, Hot Plate, Soaking Sink, Wheel Barrow, Uniform Trolley, Mobile Tab.